The best and most well known attraction in Edinburgh is its magnificent medieval Castle, which receives around a million visitors each year. Sitting atop a dramatic volcanic crag, formed around 70 million years ago, and protected on three sides by sheer cliffs that rise steeply to over 400 feet, the Castle has played a leading role in the history of Scotland for many centuries, with occupation of the site going back going back as long ago as the bronze age in 850BC. Access to the Castle is from the east, over the Esplanade. 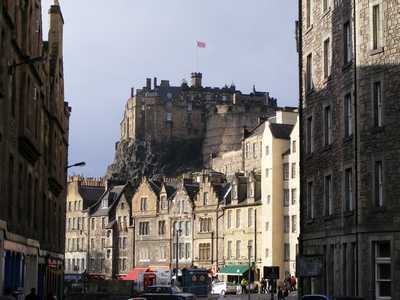 This connects to the Royal Mile which runs down to the Palace of Holyroodhouse. Look above the ancient entry gate at the Argyle Tower with its portcullis and you will see a shield bearing the Lion Rampant, with red body, blue tongue and claws. This is the shield of the Royal Coat of Arms of Scotland. The Crown of Scotland also features above the shield. After passing through the entry gate and under the portcullis, you will find on your left hand side the "Lang Stairs" These were the original link between the middle and upper wards of the castle. The steepness of the "Lang Stairs" meant that a lot of hard work and effort required to be expended to transfer goods and provisions up to the highest level of the Castle. A new and comparatively less steep route was therefore constructed, giving access to the upper ward via the quaintly named "Foog's Gate". Prior to the 18th century a loch (the Nor' loch) stood on the north side of the Castle where Princes Street Gardens are presently located. The loch was artificial and created by James II in 1450 to supplement the Castle's defences by flooding what was then a marshy area. Over the centuries however the loch slowly became more and more polluted and when draining commenced in 1759 it had in effect become a stinking open sewer. During the draining process the loch is reputed to have given up many corpses. The Castle commands magnificent views over the city and surrounding countryside and its massive walls and battlements give it a truly a formidable presence. 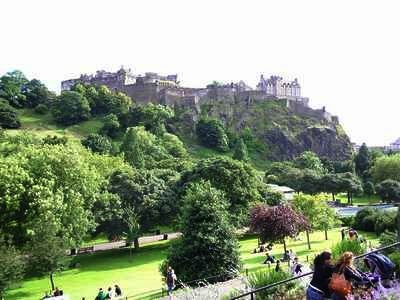 Some of the best views of the Castle can be obtained from Princes Street Gardens, close by its ornamental fountain, from Calton Hill or from Arthur's Seat and Salisbury Craggs. 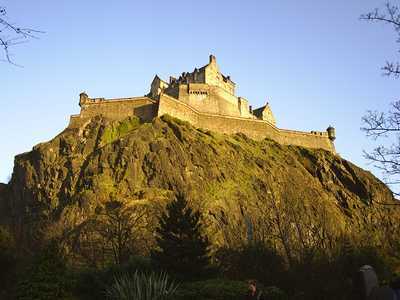 The steep craggs of the volcanic core upon which the Castle sits made attack extremely difficult. 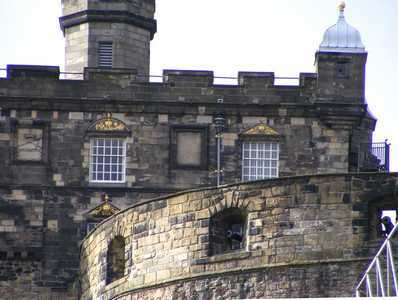 Many visitors time their visit to the Castle to see the firing of the One O'Clock Gun. Originally used to assist mariners on the Firth of Forth and to allow the townspeople of Edinburgh to adjust their clocks, the firing of the gun is retained now solely as a tourist attraction (daily excluding Sundays). The ceremony is carried out with military precision and the firing of the gun never fails to impress, leaving the assembled crowd invariably with a smile on their face. Steeped in history, Edinburgh Castle is the number one "must see" attraction for visitors to the Edinburgh, with its high vantage point providing some of the best views over the city. Statues of King Robert the Bruce and William Wallace flank the main entrance. The fortress itself holds many attractions, including the Honours of Scotland (the Scottish Crown Jewels) and the Stone of Destiny. These are counted among the best things to see by visitors to the Castle. Make up your own mind though. Here is a summary of its main features. This is the oldest building in Edinburgh, dating from the 12th century. Built by King David I (1124 to 1153) as a private chapel for the royal family, he dedicated it to his mother Queen Margaret who died in the Castle in 1093. She was subsequently canonised by Pope Innocent IV in 1250. The chapel, which can hold around 25 people, continues in use to this day for weddings and other ceremonies. The Chapel is adorned with lovely stained glass windows featuring Queen Margatet, Saint Columba, Saint Andrew and and William Wallace. Developed in the 15th century, this is the principal courtyard of the Castle. 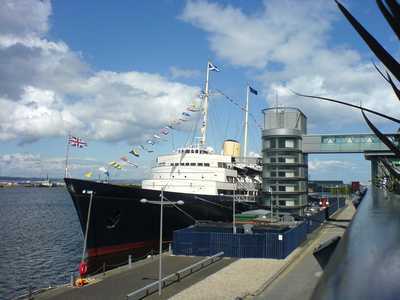 It is surrounded by a number of significant buildings, including the former Royal Apartments, the Great Hall, the Scottish National War Memorial and the tower containing the Crown Room. 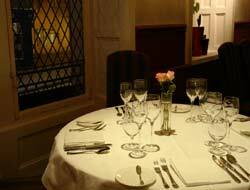 The Crown Room holds the magnificent Honours of Scotland and the ancient Stone of Destiny. 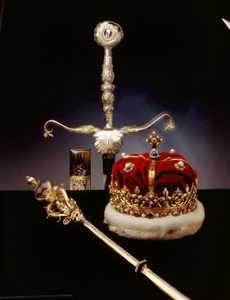 Otherwise known as the Scottish Crown Jewels (note - photography prohibited), these are the oldest regalia in the British Isles, comprising a crown, a sword and a sceptre, dating from the 15th and 16th centuries. The first time they were used together was for the coronation of Mary Queen of Scots in 1543 and the last for the coronation of Charles II at Scone in 1651. After the Treaty of Union in 1707, the Honours were no longer required and were locked away in a chest within the Castle. There they lay undiscovered for over a hundred years, eventually coming to light again in 1818 after a search of the Crown Room supervised by the great Scottish patriot and author, Sir Walter Scott. 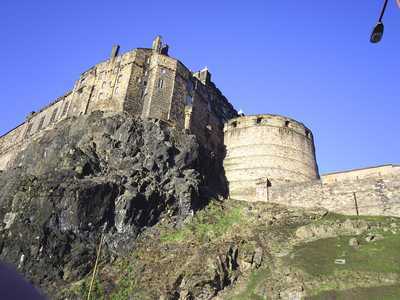 Along with the Stone of Destiny, the Honours of Scotland are Edinburgh Castle's best and most popular attractions. The Stone of Destiny was taken from Scone Abbey in 1296 by Edward I of England (otherwise known as Edward Longshanks) and used at Westminster Abbey for nearly 700 years in the coronation of English and latterly British monarchs. To great fanfare it was returned to Scotland on St Andrews Day 1996 and will only be returned to the Abbey for future coronation ceremonies. With its impressive hammer-beam roof and displays of arms and armour, The Great Hall was built in 1511 by King James IV and used for meetings of the Scottish Parliament prior to the building by Charles I in 1639 of Parliament Hall, located next to St Giles Cathedral. 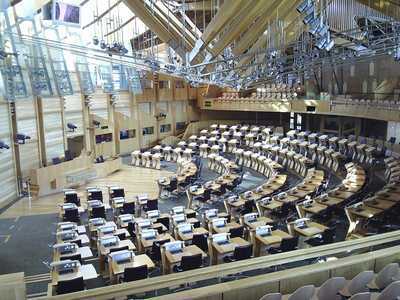 Like St Margaret's Chapel, The Great Hall continues to be used to the present day for ceremonial and other occasions, such as the New Year celebrations that are seen each year at Hogmanay and Ne'erday on television in Scotland. Completed in 1588, this was built over the remains of the former David's Tower, which itself was commissioned in 1386 by Robert the Bruce's son, David II. This Tower had previously been the main entrance to the Castle and huge by the standards of its day. In 1573 when the Castle had been held under siege for over a year (the Lang Siege) the siegers, led by Regent Morton, sought help from Elizabeth I of England. Heavy munitions were brought north from Berwick and set up around the castle. After ten days of massive bombardment much of the castle had been reduced to rubble, including most of David's Tower. Later, the Half Moon Battery was constructed on the site. 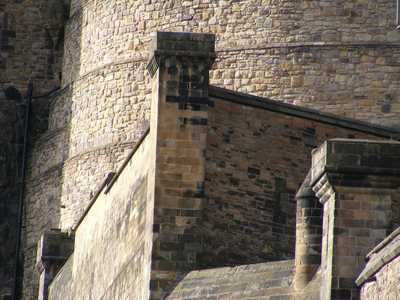 This huge, curving walled defence, like the side of some enormous drum, is one of the Castle's most iconic features. These date from the 15th century and include the tiny room where in 1566 Mary, Queen of Scots gave birth to the boy who would eventually become King James VI of Scotland and James I of England on the death of Elizabeth I of England in 1603. Note: The Royal Apartments have gold lettering above the windows. Henry IV of France called James "The wisest fool in Christendom" but this has subsequently been shown to be far from the truth. Although one of the most successful Scottish monarchs, his success was not mirrored in England where he inherited many problems from his predecessor, Elizabeth I.
James was the target of the infamous Gunpowder Plot in 1605 when conspirators led by Guy Fawkes managed to smuggle 36 barrels of gunpowder into the House of Lords in an attempt to assassinate him. The plot was discovered at the last minute and the conspirators apprehended and executed. 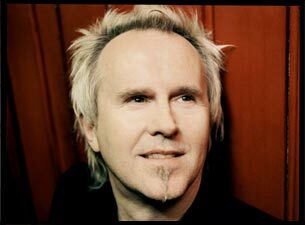 "Guys" continue to be burned each year on bonfire night (5 November) the length and breadth of Britain. Inside the Royal Apartments, the magnificently restored Laich Hall is now used for state occasions and private dining parties hosted by the likes of the First Minister (of the Scottish Parliament). This huge six-ton medieval siege gun, which was last fired in 1681 (when it burst open during firing), is named after the place in Belgium where it was made in 1449. The cannon is so big that it is reputed that someone actually gave birth in its barrel! This was added after the First World War to commemorate those Scots who fought and died in that war and subsequent conflicts. 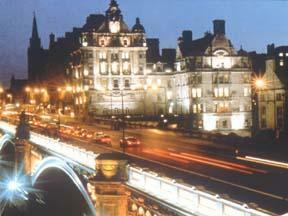 Opened in 1927, it was designed by Architect, Sir Robert Lorimer. The Memorial is open to the public, free of charge on application to the Castle Ticket Office. 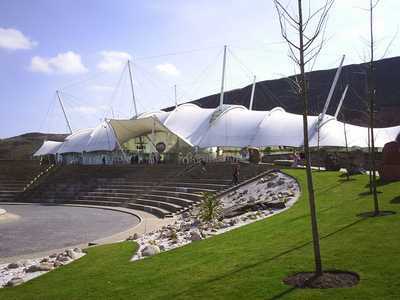 Formerly known as the Scottish United Services Museum and now forming part of the National Museums of Scotland, this museum displays artefacts and exhibits covering 400 years of Scottish military history. This includes uniforms, insignia and equipment, medals, decorations, weapons, paintings, ceramics and silverware. 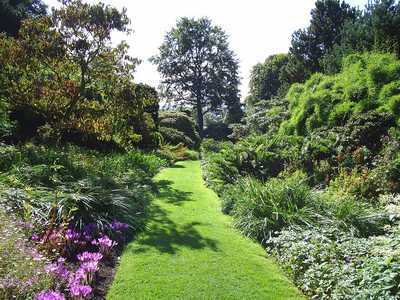 Opening Times - Monday to Sunday 9.45am to 5.45pm (April to October); 9.45am to 4.45am (November to March) Telephone: 0131 247 4413. Although the Castle has been used as a prison since the 12th century, the stone vaults were not built until the late 15th century. The quality of accommodation that prisoners enjoyed was directly related to their status or nobility. During the 18th and 19th centuries, sailors were imprisoned there from a variety of countries, including two American crewmen who sailed with John Paul Jones (Father of the American Navy), and Frenchmen who fought during the Napoleonic wars. Other nationalities held included Spanish, Dutch and Irish. Graffiti was carved on the wooden doors of the cells by many of the prisoners held there and give a valuable insight to their feelings and identities. As everyone knows, Army regiments have mascots and these are often dogs. So what happens when they die? At Edinburgh Castle they are buried in the Dog Cemetery! This picture shows the Dog Cemetery. It has been in use since Queen Victoria's time as a burial place for regimental mascots and officer's dogs. 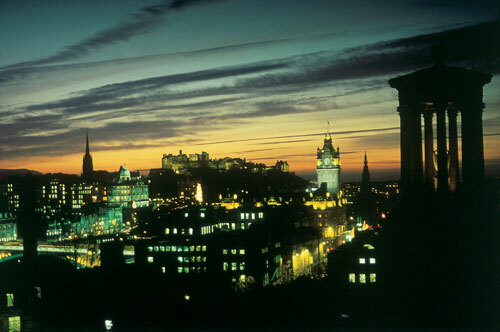 Magnificent Edinburgh Castle dominates the Edinburgh skyline and is steeped in history. 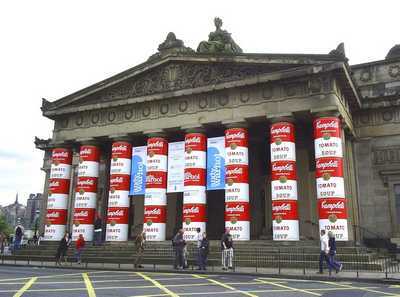 Make sure that you include it as part of your visit to the city. Please note that Edinburgh Castle now operates a timed ticketing system. To guarantee entry on the date and time of your choice you must buy tickets online in advance. The best price for entry to the Castle is online. If you are visiting the Castle today you will only be able to select an afternoon time slot when you buy your tickets online. For a morning slot you must book tickets online at least a day in advance. Amission prices are subject to change. Under 5s go free. Children must be accompanied by an adult.